AzBaja.com, Home of the VW Baja Bug -:- Baja Forums -:- Off-Road & VW Based Clubs (4x4, ATV, Jeep, Motorcycle) -:- Events and Get Togethers World Wide -:- Glamis thanksgiving? Baja Forums -:- Off-Road & VW Based Clubs (4x4, ATV, Jeep, Motorcycle) -:- Events and Get Togethers World Wide -:- Glamis thanksgiving? Post subject: Re: Glamis thanksgiving? i'll wave as i drive by on my way to san diego, more family issues.. 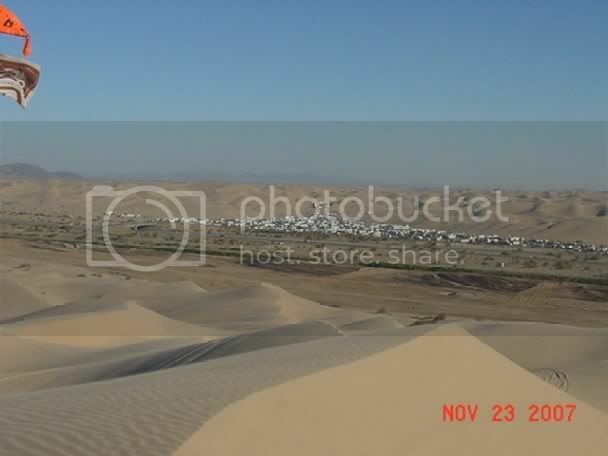 I just got back from Glamis on Monday, It's already packed! People are staying now through Thanksgiving. Lot of sik bugs! Have Fun!! NO!!! I'm such a dummy!! My batteries went dead about 2 hours after we got there, and I didn't bring a spare. Next time I go (in three weeks hopefully) I will snap alot of pics. dont they sell batteries at the store ? Didn't go to the store, but I doubt they had them, it's some special battery for my camera, not just AA's. OK, we'll hold you to it! I was at Glamis last weekend and spent the day on a Razer. Real fast but easy to flip. Wish I was going. Did you get those pics. Here's Buttercup from a distance. I'd call THAT insane! Thank God I was at HOME!!! where did the pic come from ?